Although I read a lot of crime fiction my knowledge of the authors and their books written during the ‘Golden Age’ so far has been limited to Agatha Christie, Dorothy L Sayers, Margery Allingham, and Michael Innes so when I saw that Martin Edwards had written The Golden Age of Murder: The Mystery of the Writers Who Invented the Modern Detective Story I thought it would be the ideal book to find out more. And I was absolutely right and the works of a whole host of authors has been opened up to me. This is the story of the writers who formed the Detection Club between the two World Wars. Edwards sets the authors and their works in context – that period when Britain was recovering from the horrors of the First World War, living through an age of austerity as unemployment grew, the cost of living soared leading to the General Strike whilst the rich partied and saw the beginnings of the end of the British Empire. But the writers and the works although well grounded in their own time and culture have a lasting appeal and influence on current story telling and film and television. The Club grew out of the dinners Anthony Berkeley and his wife Peggy hosted at their home in the late 1920s, attended by people including Agatha Christie, Dorothy L Sayers, Douglas and Margaret Cole, Ronald Knox, Henry Wade, H C Bailey and John Rhode. Eventually the Club was formed, with Rules and a Constitution and a Committee. The members benefited in various ways, meeting fellow detective novelists, discussing ideas, supporting each other and even working together on collaborative writing projects – such as The Floating Admiral, in which a dozen writers each wrote one chapter. The main aim of the Club was to encourage and maintain a high standard of work in writing detective novels. Their novels are often sneered at as ‘cosy’, and the claim that their characters were made from cardboard has become a lazy critical clichÃ©. The very idea that detective fiction between the wars represented a ‘Golden Age’ seems like a misty-eyed nostalgia of an aged romantic hankering after a past that never existed. There is no way I can do justice to this book in a short post; it is simply a tour de force, comprehensive, crammed full of fascinating information about the period and the authors. 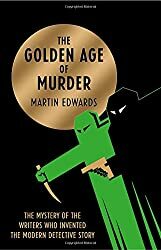 Martin Edwards’ love of Golden Age fiction shines throughout the book, (skilfully writing about books without giving away any spoilers) and has spurred me on to read more books from this period. Wow! I can’t imagine Alfred Hitchcock loosing his nerve for anything. I don’t remember ever seeing this book before, but I love mystery/suspense novels so I think I’d like this book. I think this book sounds marvelous. I have it on my Kindle and hope to dip into it soon. Love the idea of more authors to try, especially ones that come so highly recommended. This sounds fascinating! I will have to make a note of it. It reminds me that last year I read A Very British Murder by historian Lucy Worsley. Have you read it? It was a companion to her TV series of the same title. It chronicles the British obsession with a murder mystery, which grew through the Victorian period and hit a high in ‘The Golden Age’. I loved it and I think you might like it too. Oh, I’m so glad you enjoyed this one, Margaret! Edwards is not just very knowledgeable, but he’s also a skilled writer and editor. It all makes for a terrific experience, I think. This sounds like an absolute must buy, never mind must read. Thanks. This book sounds like a real gem. Thanks for letting us know about it. I’m off to see if I can find it. Hopping over from The Nonfiction Reading Challenge…. I adore stories about groups of writers but I had no idea that this group existed. How cool! This sounds like a terrific book.